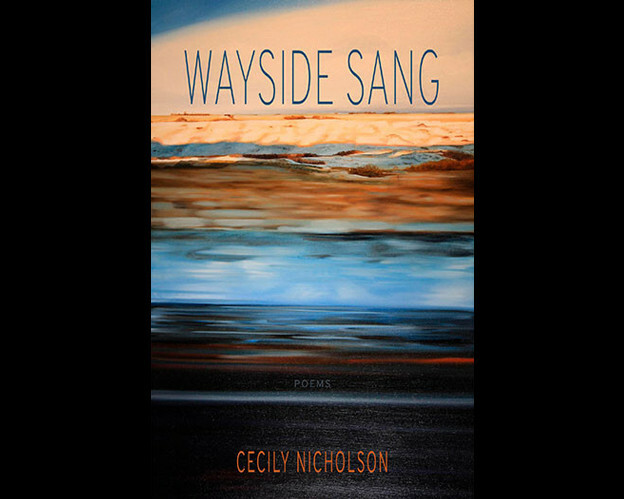 In her wonderful forthcoming book Wayside Sang (Talonbooks 2017) Nicholson traces the movement of plants (roadside weeds), animals (usually birds), geological features (post-glacial “erratics”) and human beings (typically the racialized made mobile by the fluctuating whim of capital) as they react to the pressure of forces both geophysical (erosion, weather patterns, geological features) and social (flows of capital, the built world of aging infrastructure, the border and the prison). Nicholson “performs” a biotarian sensibility by constantly weaving together seemingly disparate flows and subjections; in my comments here I simply want to give some sense of this entanglement. As the poetry (in serial form where part and whole, page and sequence, are constantly imbricated) moves out along highways alternately joy-riding and pursuing precarious labour, a complex world unfolds amidst roadside ditches, and easements become a “hermitage of thrushes,” a place marked by the “flutter of juncos” and other species. We forget sometimes that it is not only human beings who migrate, but all living things that do; and when humans alter landscapes, other species use the routes we open up to similarly move more swiftly (I note that here on the west coast of Turtle Island the Himalayan blackberry has moved, in a little over a century, from Burbank California, where it was introduced in the late nineteenth century, all the way north to Alaska — largely by arcing its canes one step at a time along the corridors cut by colonization for trains and highways). Nicholson’s eco-elegy is especially attuned to these wayside junk spaces capital produces. This is a border-erasing poetry, whether those borders are imposed on First Peoples such as the Caldwell First Nation or the Qayqayt people — and whether those are borders of economic inequity or brutal, physical force — or whether they are between “people” and “skink and the fox snake.” But it is the national border, the “logic of borderlands” and the “migrant narrative,” that comes to hold the centre of this poetry as it cuts across “foundation of glacial sand” and the “great lakes’ deep sense of time.” As birds and plants and geology stretch ignorant of something as temporary as a national border, so people move across that border too in search of work: “there’s good work at chrysler and the canadian border services agency.” Whether they are the autoworkers of an earlier phase of capitalism — these it seems are Nicholson’s own familial origins, moving south to north along the diasporic pathway — or the contemporary temporary “unseen labourers / everywhere everyday pick in the shade / of mountains” — awaiting them all are the exclusionary “sovereign privileges” of the border and its carceral regime. While the connection of “zoos” and “prisons” might not be much of a revelation, I see it in a different light when looking through the lens of the biotariat. Each human aggression against some excluded portion of the human community speaks of similar violent attitudes to “the rest of nature,” just as the mistreatment of the natural world (as mere “resource” or inanimate “milieu”/space) indicates our ability and tendency to treat some human groupings as similarly only “resources” (labour, paid or otherwise) or inanimate “objects.” Thus in the midst of a city like Nicholson’s Vancouver, “dear” — beloved — human animals are held “in cages” right underneath the architecturally award-winning public library (where indeed so-called “illegal” immigrants are temporarily jailed). Obviously it is difficult to read the relations here as literal or even causal but they nevertheless activate a poetic politics I want to call biotarian: the socio-ecological wrecks of human endeavour are shattered by the temporal shift to the geological and now like those mobile continental shifts “millions of years ago” — insert next scale jump — those human struggles in the present also seek to shatter complacent norms, whether they gather on “the steps of / the municipal art gallery” or at “Oppenheimer Park,” as social justice activists do in Vancouver, or “before / the monuments at Tompkins / Square” in Manhattan where rallies and riots over the years have challenged immigration laws, wars, and homelessness. The prophetic and projective announcement of the work’s opening was also a description of a general socioecological poiesis — in imaginative compact with love as well as lunacy — brought more fully into relief in and by socioecological disaster. This openness, this dissonance, this residual informality, this refusal to coalesce, this differential resistance to enclosure, this sounded animateriality, this breaking vessel and broken flesh is poetry, one of whose other names, but not just one name among others, is blackness. My point here is not to appropriate Moten’s discourse on blackness to that of the biotariat — rather, I simply seek to learn from and link to kindred forms of thinking. The history of racialized oppression is obviously complex enough on its own; work like Nicholson’s nevertheless sends us out to imagine both the deepest possible structures and extensions of human alienation, as well as the most personally affective forms such oppressions can take. Poetry is all the better off for the challenge of this work — for both its love, and for its lunacy.